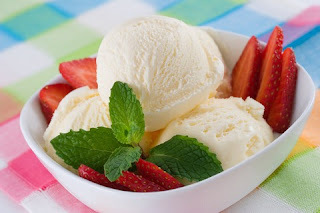 This is a fabulous ice cream with a wonderful texture and flavor and during the summer months in America and Canada, this is one of the most popular recipes on my blog! Mine actually remained scoopable from the freezer. This is the same ice cream I used with the Spicy "Apple" (chayotes!) recipe. Delicious! Try it and you won't be sorry. To use up the egg whites make my Cream Cheese Scrambled Eggs - Just add a couple more eggs to the whites and follow the recipe but make it a bigger recipe obviously. Use the cream found in cartons that sit on the shelf - I believe this makes the ice cream scoopable - therefore, no need for adding glycerin or alcohol.